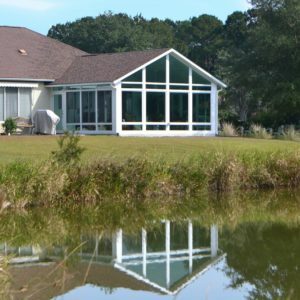 Sunrooms allow residents of the coastal region from Charleston, South Carolina, to Savannah, Georgia, to enjoy the comfort and protection of their homes while experiencing the beautiful views and natural light of the outdoors. What’s more, these additions increase a home’s living area and allow residents to create a space that is uniquely suited to their needs. Whether you are researching sunrooms because you’d like a beautiful area of your home in which to entertain guests, a quiet retreat for reading or working while enjoying the outdoors, or a room for any other purpose, turn to Porch Outfitters. We are full-service home improvement specialists with a commitment to providing unmatched quality workmanship. Energy efficiency – All TEMO sunrooms have proprietary thermal wall and roof systems, which help to keep the space comfortable all year, regardless of the weather conditions. Durability –TEMO sunroom products will maintain their beauty and performance indefinitely because, in addition to being meticulously engineered, they feature TEMKOR surfacing, an exclusive cladding material that is nearly indestructible. Beauty – TEMO sunrooms have an elegant design and come in a variety of styles, including studio, cathedral, solarium, and others, making it easy for you to find an option that complements your home’s architectural design. When you choose Porch Outfitters, your sunroom will be installed by a team of factory-certified, highly experienced technicians, ensuring you are able to enjoy all the fantastic benefits that TEMO sunrooms have to offer. And, you can be completely confident in your investment because we offer a lifetime workmanship warranty for all of our sunrooms in addition to the lifetime transferrable product guarantee offered by TEMO. Fore more information on everything the TEMO Sunrooms offer click here. If you’d like more information about the beautiful sunrooms we install from Charleston, SC, to Savannah, GA, contact Porch Outfitters today and look at our sunroom photo gallery.